I seem to have a thing for panniers that convert into backpacks. As a dedicated multi-modal commuter, I like to ride my bike to the train station, and then hop on the train to work. I need bags that can do this shift with ease, and backpack panniers seem to fit the bill best for me. Way back in 2012, I had written about the first backpack pannier I had tried, the Arkel Switchback, which appears to have been discontinued. 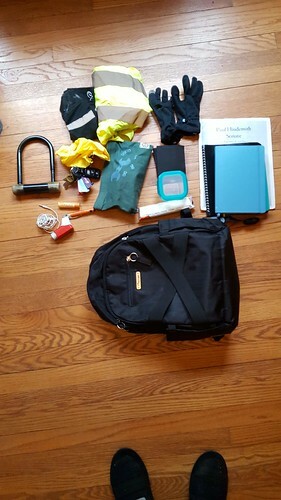 Four years later, I got the Vaude Cycle 28, which in my blog funk state, I didn’t review (but I did take a shot of it on Instagram photo of the Vaude Cycle 28). And just this week, I bought the Po Campo Irving backpack pannier. I’d like to make a few comparisons among the three bags I’ve tried. All three bags have multiple pockets to stow items inside, including a laptop, which is a necessary feature for me. The Vaude Cycle 28 and the Po Campo Irving both have side pockets for bottles and an outer area for a bike helmet, although the helmet tends to pop off the Irving when I move things around inside the bag, so I’ve taken to fastening my helmet strap to the bag’s elastic band. The bag with the most capacity is the Vaude Cycle 28, at 28 liters– The Arkel Switchback has a 16-liter capacity, and the Po Campo Irving has 18.5. (Arkel does make a larger backpack pannier called the Bug, which can carry 25 liters.) I really shouldn’t be carrying a lot of stuff on my back every day for my commute, but it is nice to have some extra room in case I need to make a quick errand and buy a couple of things on my way home, or if I want to stow my jacket in the bag when it gets warmer. I have to admit that I’m struggling a little bit with the Irving because I’m at capacity with the things I carry daily. The photo below shows what I usually carry with me. Adding my lunch bag along with my laptop made the bag overstuffed and hard to close. The bag that is easiest to transition from a backpack to a pannier was the Arkel Switchback. 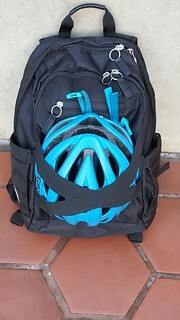 All it required was to open up the hook-and-loop-fastened panels and stow the backpack straps, close them up, and attach the metal hooks on the bag to the bike rack. Simple and quick. The Cycle 28 has a back panel that needs to be zipped up, but the metal hooks are easy to attach to the rack. The Irving requires the backpack straps to be moved to the front of the bag and fastened with the sternum strap, and then you have to fiddle with the fabric hooks with magnets at the end (that are quite durable, to their credit) to attach to the rack. I do like the hi-viz and reflective details on the straps, however. The bag that is the most comfortable to use as a backpack is by far and away the Po Campo Irving. Both the Switchback and the Cycle 28 are weighted down by those metal hooks and the fabric used for the bags themselves are heavy– the bags weigh 2.25 lbs/1.0 kg and 2.6lbs./1.2kg, respectively. I also had a hard time adjusting the straps to evenly distribute the weight of the load. By contrast, the Irving is made of lighter fabric, the hooks are embedded within the foam in the back so you can’t feel them, and the straps are easier for me to place the bag higher on my back. It also includes a sternum strap, which the other bags did not have. It feels the most like a real backpack, and in spite of all that I carry, there were a couple of times that I felt compelled to check my back to make sure the bag was still there– that’s how light it felt. The Irving weighs in at 1.75 pounds (.79 kg). Time will tell to see how well the Irving’s fabric will stand up to repeated wear– if I continue to stuff the bag as I’m doing, that may not last very long. If the Irving had as much capacity as the Cycle 28, I would recommend it unreservedly as a backpack pannier. As the Switchback is no longer being made and the Cycle 28’s construction has been updated since I had bought it (the mechanism for converting from backpack to pannier is quite different now), I don’t have a better alternative right now. I’m going to have to be a little more creative in packing my bag for my work commute, but I’ll make the Irving work for me. More photos can be found on my Instagram. The last photo shows the difference in size between the Irving and the Cycle 28.